The OSE-moulds are more robust and stable in shape than common blisters. They can be twisted and knocked out firmly for a perfect demoulding. The standard version is 1,00 mm thick and made of polycarbonate. 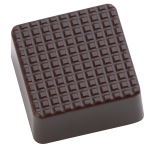 These moulds can be washed like normal chocolate moulds at up to 60°C. Additionally added overlay guards at the sides prevent the forms from slipping over another. 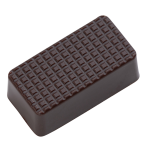 The pralines have a slightly textured surface, so the fluid enrobed coating can adhere better. 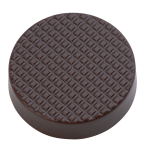 With this mould program we offer an alternative to one-time blisters which saves resources and is reusable. 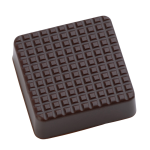 With our flexible production and article-development, similar praline versions (e.g. custom-made) and other material thicknesses are achievable without any problems at favourable costs.